Public anger over the government’s workfare schemes has kicked off this week following the widespread online circulation of adverts for "jobs" in Tesco paying only travel expenses and JSA. Laura argues that feminists need to join the fight. Public anger over the government’s workfare schemes has quite rightly kicked off this week following the widespread online circulation of adverts for “jobs” in Tesco paying only travel expenses and JSA (jobseeker’s allowance). HarpyMarx has some great photos and video from the protest outside the Westminster branch at the weekend. But it’s not just Tesco – hundreds of companies and charities are signed up to the scheme, which sees welfare claimants forced to undertake work experience or “mandatory work activity” or face losing their benefits. As Cait Reilly, who was forced to work in Poundland, is quite rightly arguing in her legal case against the government: workfare is nothing less than forced labour, and it needs to be stopped. …put a young person into college for a month’s learning, unpaid – and it’s hailed as a good thing. Here’s the difference, Mr PM (and I can’t believe I even have to explain this). Colleges are designed specifically to equip young people with skills and knowledge to enable them to develop as individuals so they can make their way in the world. Supermarkets are designed to make a shitload of cash for a private corporation. When a young person goes to college, they are being provided with a useful service. When a young person goes to work in a supermarket, they are providing a useful service. Hence, in the latter case, they should be paid. Claiming that young people are learning when they work for free in these kind of companies is a piss take. 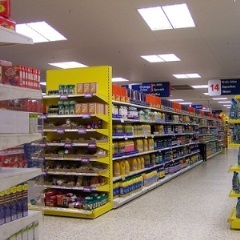 When I worked in Tesco, it took me about ten minutes to learn to stack and face up shelves. Not weeks on end. There’s nothing wrong with stacking shelves, but we should damn well be paid for it. I personally know a fifty-six year old man who worked at Tesco for 40 hrs a week for 6 weeks for no pay. He said he was given the worst job, constantly filling freezers in the hope he would be taken on. After the 6 weeks were up the manager asked him if he would like to stay on for some extra weeks, my friend asked “with pay”? The manager said why would he pay him when he can pick the phone up and get more unemployed people who have to work for nothing of face sanctions meaning loss of ALL benefits for up to three years! The government’s line of argument on workfare is a contemptuous joke, and we need to put as much pressure as we can on both them and the companies and charities supporting workfare so we can bring this disgusting practice to its knees. With twice as many women being made unemployed as men as a result of the government’s cuts, this is a cause that feminists really need to get behind. Sign the petition to end benefit/workfare schemes. Join the national day of action against workfare on Saturday 3 March. Tweet your concern directly to those involved. Like the Boycott Welfare Facebook page to keep up-to-date with developments. Boycott Welfare also have a list of tips to help you avoid being forced into unpaid work. Photo by Andwar, shared under a Creative Commons licence. So, tax payers are paying unemployed people about 1.50 an hour to work for Tesco? If our economy depended on Tesco, and Tesco was about to collapse, I could almost understand…. . But Tesco is ripping off it’s producers, as usual, and doing ‘excellent business’. If Tesco have so many empty positions, they could just employ these people, and (just for novelty’s sake), pay them. If Tesco want to do some social good, (I would be shocked), they could try reducing the weekly hours of their current staff while maintaining the same weekly pay, (a pay rise per hour), and then picking up the slack with some extra employees. They can afford this. They really don’t need to be abusive, it’s a choice. If the government want to ‘encourage’ people back to work, (though when theres 22 people applying for each job, I’m not sure encouragement will do it), they need people to feel respected in the position. 1.50 and an assumption to cast off after 6 weeks does not say respect. I personally would like to see the living wage brought in, and am quite saddened that instead we’re having to defead the minimum wage. Plus, theres alot of disrespect being sent in the shelf-stakers direction at the moment. It’s a job, if you’re getting paid and your workers rights are being respected, it’s not a bad job. The contant middle class assumption in politics that nobody wants to ‘dirty’ themselves by doing a working class job really starts to grind! The issue is that this government and the previous one are deliberately exploiting unemployed women and men by forcing them into working for nothing at various private companies. Guess who benefits from all this unemployed labour and no it isn’t the unemployed women and men – it is those numerous private businesses; multi-national corporations and not forgetting numerous charities. All of these companies/charities are profiting by having unemployed women and men undertake work and not having to pay them a penny. This is labour exploitation of unemployed women and men. Another issue which Cameron and his cronies conveniently ignore is the fact many of these companies are taking on unemployed women and men and thereby ensuring the company doesn’t have to employ a person and pay that person a minimum hourly rate. The savings in national insurance etc. are immense but Cameron doesn’t want Josephine and Joe Public to know this. In effect Cameron and his cronies are ensuring the lack of job opportunities continues because there is an abundance of primarily highly skilled women who happen to be unemployed and available to forced to undertake work for no pay! But Cameron and his male cronies in their arrogance and bigotry claim the unemployed women and men protesting are all ‘job snobs.’ The real job snobs are Cameron and his male cronies because their lack of practical experience in economics has never prevented them from obtaining highly paid work as a Member of Parliament! I’ve been unemployed and yes I too was told I would have to attend a work programme and I was also told I would only receive my miserly £67.50 a week job seekers allowance and in return I was told I would have to work 30 hours a week. My only ‘bonus’ was my right to claim travel allowance. Big deal – and I was expected to continue looking for paid work as if I had so much time after working 30 hours a week for nothing. Job Centre Advisor also told me (wrongly as I later learned) that if I refused I would be denied my rightful Job Seekers Allowance for at least two weeks as punishment. Yet Cameron claims this slave labour scheme – aka work schemes – are voluntary and no unemployed woman or man is being forced to undertake this slave labour. Guess who are the liars and no it is not the unemployed women and men. Would Cameron and his cronies accept a huge pay reduction wherein they would only receive £67.50 a week because they are all millionaires and hence do not need a Minister’s/Prime Minister’s salary? Now that would save the mythical male taxpayer thousands and thousands of pounds being awarded to male MPs who are not fit for the jobs they undertake. But all the rhetoric and accusations emanating from Cameron et al is a diversionary tactic because on no account must it be publicly acknowledged that the UK is in deep recession; that unemployment is rising and jobs are becoming like the unicorn – non-existent. Businesses are being encouraged by Cameron et al to apply to have unemployed women and men work in their companies for nothing because according to Cameron ‘it is good business practice!’ Of course it is for multi-national corporations and businesses large and small since they are saving huge sums of money by not having to employ anyone and pay them money. This is the reality of our fascist Tory government – exploiting disadvantaged women and men and ensuring the men in suits continue to profit and expand their wealth. It used to be a ‘best practice’ volunteering policy that you should never use a volunteer to do the job of a paid employee; a policy that most councils used to adhere to. Some interpreted that quite strictly to mean that you couldn’t take on any activity that was part of someone’s job; so volunteers were to give added benefit (things that would not otherwise happen), not maintain service standards etc. Sometimes this was frustrating, but ultimately, I think it was right. Otherwise, volunteering is open to horrendous exploitation. My 39 year old nephew has to start work in the council offices from tomorrow, 30 hours a week for 6 weeks for no pay except about £70 a week job seekers allowance and I think he also gets his bus fares reimbursed. On his day off he has to go to sign on at the job centre. If this has any chance of turning into a job it seems like it could be a good thing but I can see how some employers will be laying off paid staff to take advantage of this slave labour. I think there should be at the very least a bonus payment to trainees paid by the companies taking advantage of this scheme. Some years back when I was on a so-called training scheme (learning how to diddle the VAT for a small clothing factory). I used to get £10 a week extra then although I had to pay the first £4 of travel costs out of this, I thought £6 a week extra was a joke to work a full-time job but I was able to quit without losing benefits. Actually I didn’t mind the job but hated the training day at the Chamber of Commerce centre but I only decided to quit after the factory moved the office to a dark and dingy room where the solar-powered calculator wouldn’t work unless I turned away from the desk and leaned towards an open doorway, still makes me smile when I think about it. Hopefully all new training placements will be for better companies than that but I don’t hold out much hope.